Insights on the world by Jackson School of International Studies' students, faculty, staff, and alumni. By Arda İbikoğlu, M.A.I.S/Ph.D. alumnus. This post was also posted on Dr. İbikoğlu’s blog where he has been contextualizing the Turkish protests. I have shared some protest graffiti before. 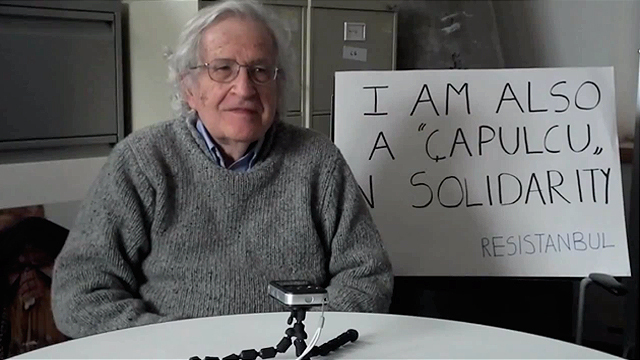 This time I will try to translate some other examples of ingenious protest humor. This is gonna be fun! My all-time favorite cartoonist Selçuk Erdem’s tweet on June 3, is both an example and a summary of the power of humor in Gezi protests: “Let’s not throw stones. Let’s throw jokes. Let’s use disproportionate intelligence!” One of the things I’ve learnt in these protests was how police could provoke peaceful protesters by using disproportionate violence. Experiencing such unreasonable levels of violence on themselves and their friends, the protesters would get angry and agitated. They would strike back with whatever means were at their disposal, usually just stones and clubs. This, in return, would pseudo-legitimize police’s use of violence as they would then appear to be in a struggle to contain violent protesters. 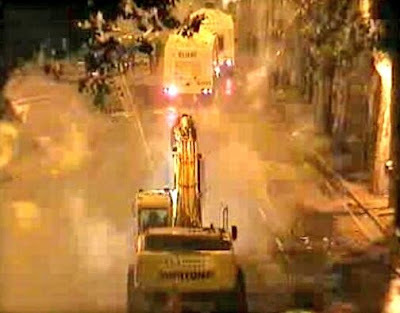 The Gezi protesters have demonstrated their ability to collectively control their reactions and nullified such baiting tactics by the police, to a great extent. This, obviously, reduced the number of tools available for peaceful protesters tremendously. However, as the Gezi protests demonstrated, “the use of disproportionate intelligence” is a great weapon that damages the opponent’s reputation while uplifting morale within ranks. Oh yes, time for some examples! A perfect peaceful curse, don’t you think? Here is a perfect artwork that plays with the AKP emblem. No commentary needed! 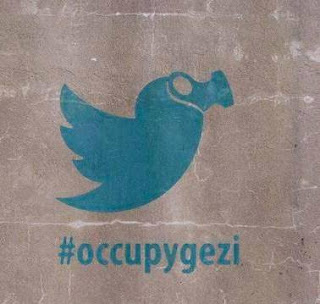 Another piece that symbolizes the #occupygezi’s reliance on twitter. Just perfect! These two images are awesome examples of reappropriating the opponent’s arsenal through disproportionate use of intelligence. The empty cases in these images are empty tear gas cannisters. 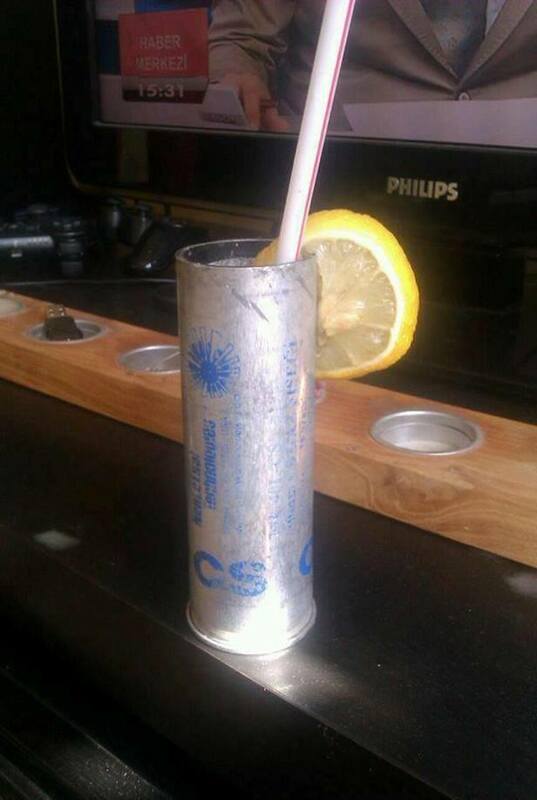 The first one is used as a lemonade cup with a sliced lemon and a straw. The second one is even better. 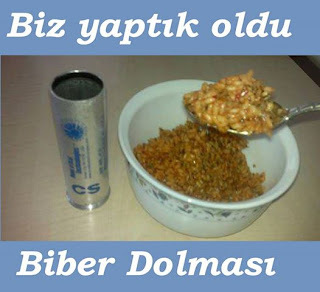 Tear gas is called “pepper gas” (biber gazı) in Turkish. 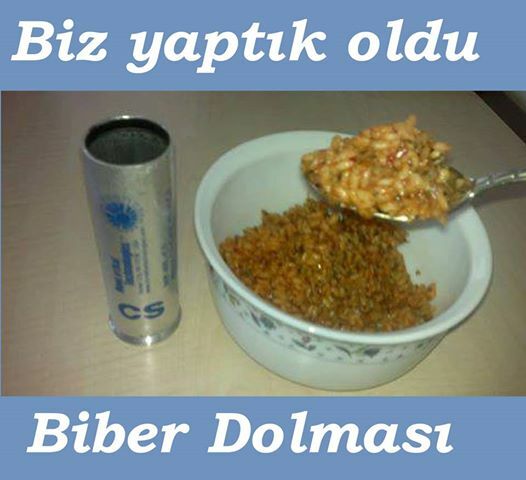 As you know, Turkey has delicious pepper dolma (biber dolması), i.e. fat green peppers stuffed with rice. Well, there is a stuffed pepper for you! What helps against tear gas? Vinegar! 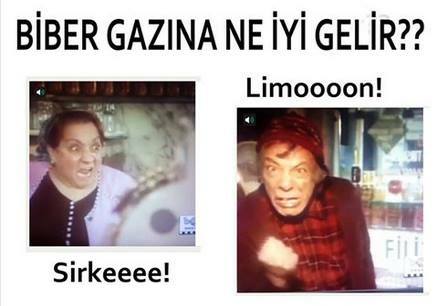 Lemon! 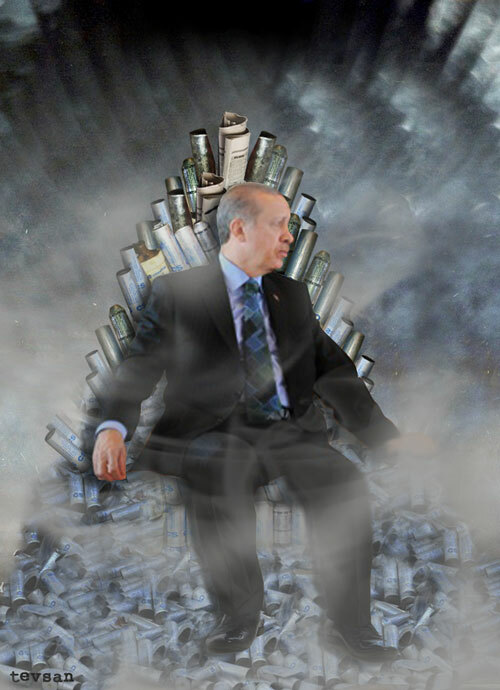 Erdoğan sitting on a throne of empty tear gas cannisters. It is quite a powerful image. The shape of the throne is another reference to famous TV series, Game of Thrones, based on George R. R. Martin novels. If you were wondering how the penguins got involved in the Gezi protests that very quickly enveloped the entire country, here is why. 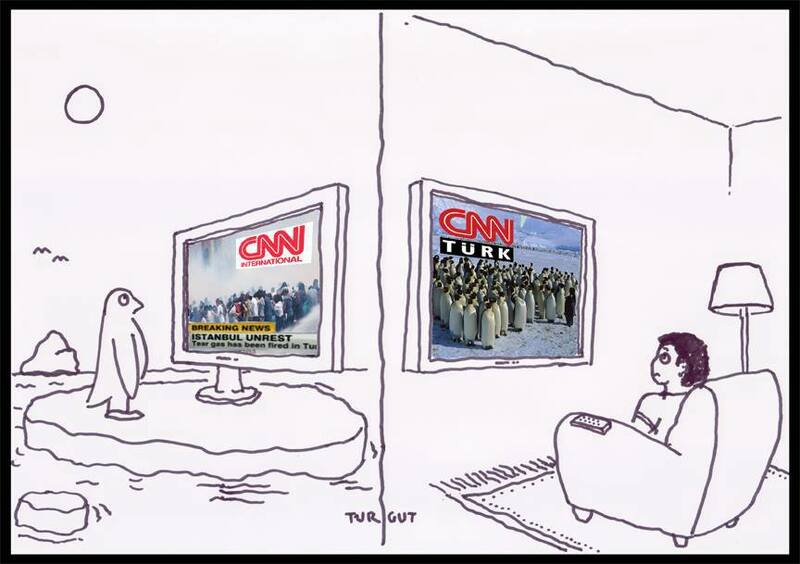 At 1:06 AM, on June 2, at the peak of demonstrations and clashes, CNNTÜRK, a franchise of CNN, was broadcasting a documentary on penguins, whereas CNN International was broadcasting the ongoing events live on the ground. This irony was not lost to the protesters and soon penguins became somewhat of a symbol for #OccupyGezi. Above is a cartoon mocking CNNTÜRK. 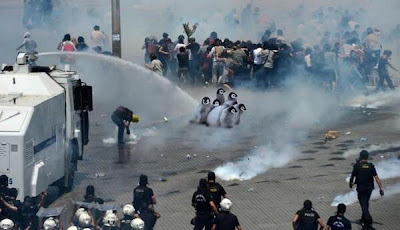 And the penguins were spotted in the protests. And finally an international Çapulcu below! Chief: Open a hole in the barricades, don’t go in too much! Chief: Now move back, spraying water! Chief: Toma 9, you spray water at the same time too! Toma 9: I am Vedat, listening! Chief: Oh, who is Vedat? Toma 9: From the open stands, the drummer! 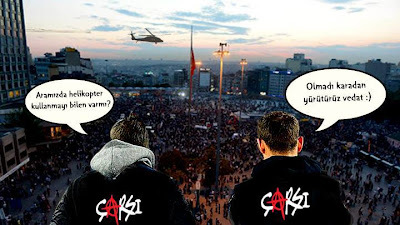 Left Çarşı activist: Do we have someone who can drive a helicopter? Excellent joke about capturing a helicopter this time (while underlining the continuing airborne surveillance of Taksim Square) with a reference to Vedat, the POMA-captor! Arda İbikoğlu is an alumnus of the M.A. in International Studies Program. He also has a Ph.D. in Political Science from the UW and Middle East experts from JSIS served on his doctoral committee. He is an expert in Turkish and Middle East politics and his research focuses on Turkish political prisoners and changing state-society relations in Turkey from the Ottoman Empire to the present. He has published articles and book chapters on this subject, including an article featured in a Special Issue of Studies in Law, Politics, and Society that highlighted the “next generation” of interdisciplinary legal studies. He is currently a postdoctoral researcher at Boğaziçi University in Istanbul. You can follow Dr. İbikoğlu on Twitter here. 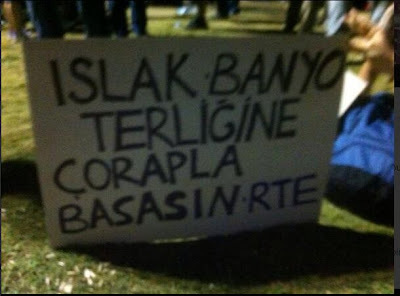 One Response to "“Let’s use disproportionate intelligence!” Humor in the Turkish Protests, Istanbul"
The views expressed in the blog posts are the views of each individual author and do not represent the views of the University of Washington, the Jackson School, and/or any affiliated University of Washington units.